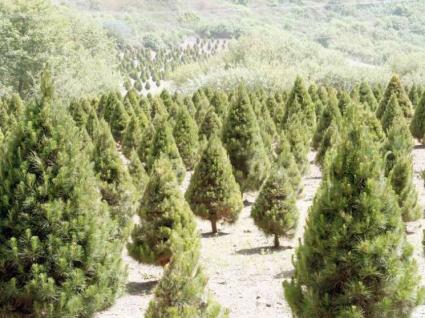 As you walk through the forest or hunt for the perfect Christmas tree, you may not realize how many varieties of Fir trees there are on this lush place we call home. 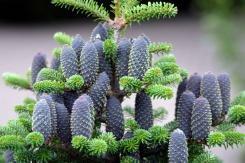 There are about 45 to 55 species of fir trees in the genus Abies. These evergreen conifers, members of the family Pinaceae, are closely related to cedars. Firs are found in mountainous areas of Europe, Asia, North Africa, and North and Central America. Fraser Fir and Balsam Fir are both native to North America, with Fraser Fir growing in the northern regions and Balsam Fir occurring in a limited area of the Appalachian mountains. The two species are very similar and scientists have speculated that they may once have formed a single species. Both are very popular Christmas trees. The Balsam Fir was formally identified in 1768. Its scientific name, "balsamea", comes from the resinous blisters in the bark. Balsam Fir is the Provincial tree of New Brunswick. The Fraser Fir was named after the Scot botanist, John Fraser, who explored the Appalachian Mountains in the late 18th century. This tree is sometimes called the Southern balsam fir. All firs are trees; there are no shrubs in this genus. They can reach mature heights of 260 feet with trunk diameters of up to13 feet. They are differentiated from other members of the Pinaceae family by their erect cones and winged seeds.Both Fraser Fir and Balsam Fir are uniformly pyramid-shaped trees, which makes them particularly suitable as Christmas trees. They have strong branches that turn slightly upward. Both the Balsam Fir and the Fraser Fir grow well in sun to partial shade. They like well-drained soil that is high in organic matter. They prefer a mildly acidic soil but are quite tolerant of a wide pH range. These trees have a shallow root system, so they do well in rocky locations with thin soil layers. Their moisture requirements are moderate. Trees can reach 150 to 200 years of age. Balsam Fir is hardy to zone 3; Fraser Fir requires warmer temperatures. The wood of fir trees is brittle. It is often used as pulp or in the manufacture of plywood. It is also used for interior knotty paneling, light frame construction, and crates. Fraser Fir and Balsam Fir are the most popular Christmas trees in North America. In landscaping, fir trees are planted for screens and windbreaks. The resin in the blisters on the bark of Balsam Fir was traditionally used as a cold remedy. During the Civil War, it was made into an ointment used on combat injuries. The resin contains oleoresin, which is employed for mounting microscope slides. Torches were traditionally made from resinous fir knots. Boughs were used to stuff aromatic pillows. Fir trees are easily damaged and uprooted by high winds. Spruce budworm and balsam woolly adelgid are the most dangerous pests. Heart rot fungus can be a problem in older trees. See Silver Fir for a descriptive list of Abies species.